This kit contains all the necessary parts to convert non-tilt/trim Evinrude® and Johnson® outboards to full trim/tilt operation. This kit is used on 60 through 140 20 in. and 25 in. length models. This kit will not work on standard length outboards. Read installation instructions completely prior to starting work. When replacement parts are required, use genuine BMCA parts or parts with equivalent characteristics including type, strength and material. Failure to do so may result in product malfunction and possible injury to the operator and/or passengers. Trim Gauge and Trim Switch not supplied with kit. To avoid accidental starting of the engine while servicing, twist and remove all spark plug leads and disconnect the battery cables. This kit can be installed directly on the motor when mounted on a boat or on a motor stand. If the motor is on a transom, make sure there is enough clearance in the boat well area for motor to be fully tilted. If a motor stand is used, be sure the stand is securely mounted. Tilt motor to full tilt position and engage tilt lock lever (A) in tilt up position. Install a holding strap or a rope (B) around gearcase to make certain motor will not fall. When installing trim/tilt on manual tilt models with roll pin, the roll pin must be removed. Grasp firmly with vise grip pliers and pry out. NOTE: Failure to remove roll pin will result in damage to the trim/tilt motor. Remove four screws and lock washers (C), which hold the spacer and tilt cylinder between the stern brackets. Retain lock washers and discard screws. 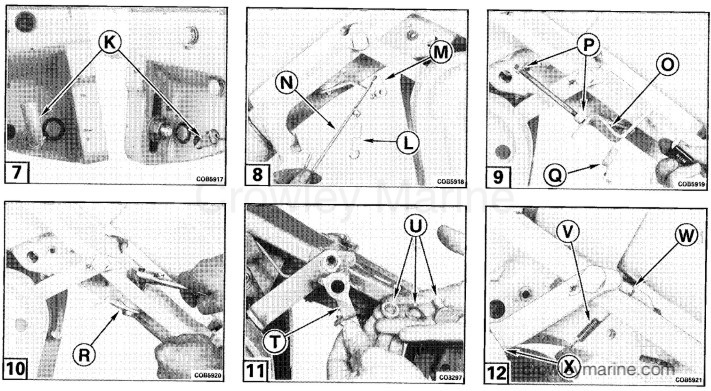 Remove two release lock springs (D), pin (E) and locking lever (F). Remove and retain two spring clips (G) and the tilt cylinder pin (H). Remove and discard the tilt cylinder (I). Remove and retain two plastic bushings (J). Hold the angle adjusting rod facing up and press it against spring pressure to position the retainer in release position (K) and remove rod. Remove trail lock return spring (L), releasing rod bell crank (M), and reverse lock release rod (N). Remove lever and shaft (O), two spacers (P) and trail lock spring (Q). Remove port and starboard spring retainers. (R). Retain the two screws and discard retainers and locknuts. When installing this kit on 1977-1979 outboards, remove port side locking cam lever (T) and manual tilt handle and discard. Re-install the washers and screw (U). When installing this kit on CS and newer outboards, a new trail lock spring (V) must be installed from the locking lever rod through the opening in the swivel bracket and attached to the reverse lock retainer on the port side of the swivel bracket. To install spring on tilt rod, the motor may have to be tilted higher to allow enough clearance for spring to hook around tilt rod (W). Do not raise motor higher than needed to install spring. make sure there is enough clearance in the boat well area. After spring is installed on rod, lower motor back so locking levers are resting on the stern brackets. (X). Install port and starboard thrust pads (Y) with new locknuts provided in place of discarded retainers. Tighten nuts securely. Press plastic bushing (Z) into the port stern bracket hole and route sending unit leads (A) through bushing. Install sending unit (B) on port stern bracket. Tighten screws securely. Open trim/tilt manual release valve (C) one turn and pull tilt cylinder piston rod out several inches. Lubricate tilt cylinder pin with Triple-Guard® grease. Install two plastic bushings in tilt cylinder rod (D). Install bottom of tilt cylinder unit first, until mounting holes line up. Tilt unit upward until cylinder rod hole lines up with swivel bracket hole. Install tilt cylinder pin and two spring clips (E). 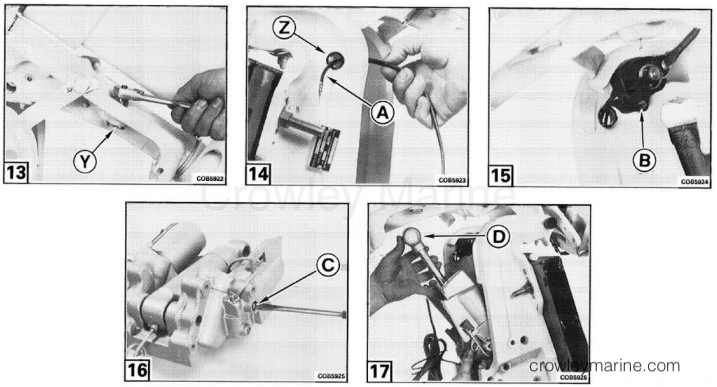 Use screws (F) furnished in plastic bag with six lock washers (four from engine, two furnished in kit) to complete assembly of manifold to stern bracket. Tighten all screws to a torque of 18-20 ft. lbs. (24-27 Nm). Route trim/tilt leads (G) through port stern bracket bushings. Install angle adjusting rod in the same location as removed. Make sure rod passes through both stern brackets. Press in against spring pressure, turn angle adjusting rod handle down, and make sure retainer drops into lock position (H). Close manual release valve. Motor will remain at full tilt position until junction box and trim switch are installed and operated. The power tilt should be used to lift and support the motor, and the manual release valve must be closed before disengaging the trim/tilt lock. If left open the motor could drop unexpectedly. NOTE: When installing this kit on 1977-1979 outboards, loosen the port tilt tube nut and transom mounting nuts. Move stern bracket out to allow enough clearance so trim/tilt unit can be installed. Tighten tilt tube nut to a torque of 24-26 ft. lbs. (32-35 Nm), than back off nut 1/8 to 1/4 turn. Tighten transom mounting nuts securely. NOTE: Refer to Junction Box Installation Instructions, P/N 124514 for proper routing and installation of sending unit leads, trim/tilt leads, trim gauge and the trim/tilt switch. Install to black leads from the sending unit into the square connector. Install blue and green leads from the trim/tilt unit into the "T" connector. Make sure that the blue and green leads from the trim/tilt match up with the junction box blue and green leads when they are plugged together. NOTE: If the wires are positioned incorrectly, the trim/tilt unit will operate in the opposite direction from that shown on the control switch. Cycle trim/tilt unit up and down several times to check for leaks and proper operation. If unit does not operate correctly, air in the hydraulic system may be the cause. To purge air from system, cycle unit up and down five more times. To check hydraulic fluid, it is necessary to raise motor until both trim cylinder rods (I) and tilt cylinder are fully extended. To check for fluid level in the reservoir, remove fill plug (J). The fluid level should be visible at the fill plug hole. 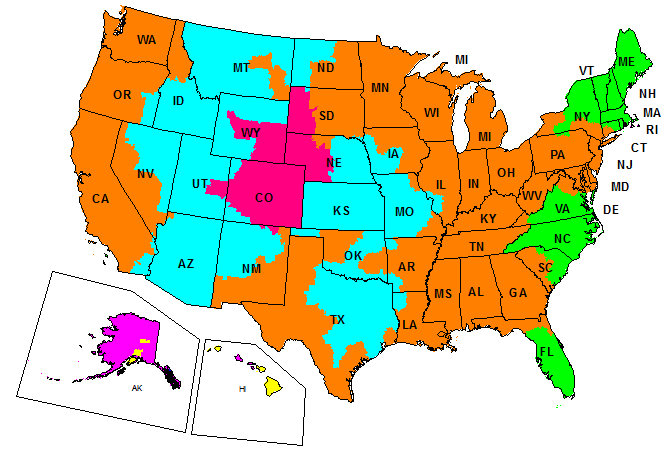 If additional fluid is needed, use Power Steering Fluid P/N 174502. Install fill plug and tighten securely. a. Turn ignition key to "ON" position. b. Raise motor to maximum tilt up position. c. Rotate the trail lock to run position. d. Move angle adjusting rod (K) to number three hole (L). e. Loosen sending unit screws (M), until only snug, so sending unit (N) can be pivoted. f. Lower engine all the way down against angle adjusting rod. g. Observe trim gauge. If needle does not show center position, adjust sending unit (O) by pivoting it up or down with screwdriver (P), until gauge shows needle in center position. 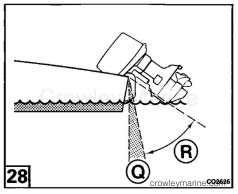 The minimum trim angle is that which results in maximum bow down position without causing unexpected changes in direction as a result of "plowing" through the water. This angle must be determined for your particular boat/motor combination. Failure to determine and set the minimum trim angle can result in a boat/motor combination capable of making sudden, unexpected changes in direction with possible loss of control. 1. Lower motor against angle adjusting rod. Make a trial run by accelerating gradually to full throttle and noting the boat's performance characteristics. 2. If the maximum bow down position results in so much "plowing" that directional stability is adversely affected, the angle adjusting rod should by moved out one hole and the trial run repeated. 3. Before moving angle adjusting rod, stop motor and tilt motor to full tilt position. Move angle adjusting rod and lower motor completely. 4. Continue this procedure until the best minimum trim angle is achieved for your boat/motor combination. The power trim has a range of 15 degrees (Q) and may be operated at any boat speed or at rest. The degree of trim is controlled by use of the trim/tilt switch. The trim gauge, which operates when the ignition is on, indicates the trim position of your motor. To operate the power trim, hold the trim/tilt switch in the "UP" position to raise the bow or in the "DOWN" position to lower the bow of the boat. While observing boating safety rules, accelerate the boat from a standing start to full throttle. Note the time it takes for boat to plane, the maximum tachometer reading for each test, and the ride and action of the boat. In general, bow down provides the best acceleration and smoothest ride in rough water, while bow up provides the best speed, fuel economy, and driest ride. Some boat/motor/propeller combinations may encounter marginal boat stability and unusually high steering torque when operated at high speed at or near the full bow up trim position. If these conditions occur, throttle back to maintain control. Marginal boat stability and high steering torque can be minimized by proper setup and the correct steering system. Contact your dealer for corrective procedures. When operating in very shallow waters, the motor may be tilted slightly higher than normal trim range and operated at slow speeds. (Be sure the motor's water pump intake is in the water at all times.) The motor should be lowered immediately when back in deep water. The angle of motor tilt is also controlled by the trim/tilt switch. On a typical boat the tilt range (R) is an additional 53 degrees beyond the trim range. When the switch is held in the "UP" position, the motor is tilted up until the switch is released of the motor reaches the maximum tilt position. The motor is tilted back down to the normal running position by holding the switch in the "DOWN" position. The trim gauge will show maximum bow up position whenever the motor is in the tilt range. Tilting is normally used for raising the motor to obtain clearance when beaching, launching from a trailer, or mooring. We recommend your motor be trailed in its normal running position. If trailer does not provide adequate road clearance, a Trail Lock is provided to secure motor in full tilt position for trailering. NOTE: Do not trail motor in a tilted position unless trail lock is engaged. Failure to engage trail lock while trailering may damage the hydraulic system. 1. Place motor in full Tilt position. See, "Tilting". 2. Pull trail lock down so it rests on stern brackets. A detent will hold the trail lock in trailering position or in stow position. 3. Lower motor so that trail locks reset against stern brackets, and the two trim rods are fully retracted. 1. Tilt motor to full tilt position. The power tilt should be used to lift and support the motor before disengaging the trail lock. 2. Move trail lock up into run position. Position motor in full tilt position before launching. In the event of failure of the boat's electrical system or other problems, it may be necessary to raise or lower the motor manually. Turn manual release screw counterclockwise slowly ONE TURN ONLY - this will allow motor to be pushed down to the outermost trim position. Keep clear of motor when backing out manual release screw. After the motor is lowered, be sure to tighten manual release screw clockwise until it stops. This will reactivate shock absorber and reverse thrust capability. The motor is now in the bow up trim position, and must be operated in a manner suitable for this condition. Disconnect the battery terminals before opening the junction box. 1. Remove two center screws (S) on the junction box. 2. Remove the rubber fuse holder located in the top of the junction box. 3. Pull the fuse holder apart. If the fuse if bad, replace the fuse with the same type of fuse (Littlefuse 1. A.G.-30 AMP or Buss A.G.A.-30 AMP). Connect the battery cables to the battery. Tighten terminals securely.